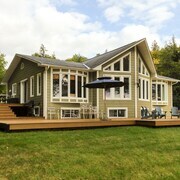 Waterfront Cottage 4 Seasons on Navigable Lakes 3 Wow! Private Lakefront Hideaway ~ Spa, Fireplace, Peace And Comfort! European-style Mountain Chalet Views of Lac de la Mine! Very cool and beautiful property in general. Hotel staff were pleasant and available whenever you needed them. It is a pet friendly hotel which is AWESOME and you barely even notice it. The hotel itself is a bit outdated and needs some major updating (which is happening right now). I think it has lots of potential but is missing the general Fairmont brand that you see at other Fairmont hotels/properties which was a bit disappointing for the price you pay/night. Nonetheless, we loved it and will consider a return... once the renos are done! Where to find Lac-Simon hotels near an airport? 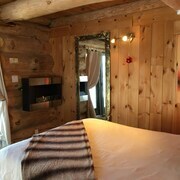 Where can I find hotels in Lac-Simon that are near tourist attractions? With only 1 Expedia-listed accommodation option within a 0.1-kilometre (0.06-mile) radius of Lac-Simon's downtown area, consider booking a place to stay well before you fly. The Fairmont Le Chateau Montebello, Quebec, which is the closest accommodation, sits 30 kilometres (19 miles) from downtown Lac-Simon. Also, investigate the Auberge Couleurs de France, located in Quebec, which is 13 kilometres (8 miles) away. 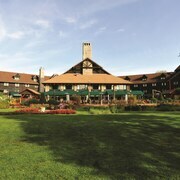 The Auberge Montebello is 30 kilometres (20 miles) away from the heart of Lac-Simon. 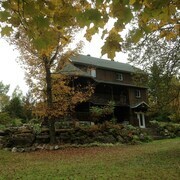 The LM Stays - Winterized Cottage is 5 kilometres (3 miles) distance away. Consider spending a few hours discovering Maclaren Cemetery and MacLaren Mill, which you'll find in Wakefield, 70 kilometres (44 miles) to the southwest of Lac-Simon. Should you wish to stay in Wakefield, check Expedia's booking pages for the latest deals at the Moulin Wakefield Mill Hotel & Spa and Auberge De Mon Petit Chum B&B. 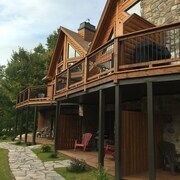 Alternatively, you could stay in Gatineau, 65 kilometres (40 miles) to the southwest of Lac-Simon, where you can pick from the Comfort Inn Gatineau and Hotel V. The Canadian Museum of History and Casino du Lac Leamy are just some of the more popular places to check out while in Gatineau. Before you leave Outaouais, make sure you experience some local sport. Visit Canadian Tire Centre to the southwest of Lac-Simon. If you are keen on staying close by, make a reservation in the Holiday Inn Hotel & Suites Ottawa Kanata or Fairfield Inn & Suites by Marriott Ottawa Kanata. 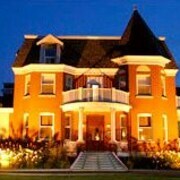 Thanks for taking the time to check out our Lac-Simon hotel listings. Next, do yourself a favour and spend a few minutes exploring Expedia's Lac-Simon travel guide for the inside scoop on this area's scenic and cultural delights. 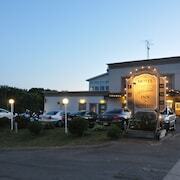 What are the most popular Lac-Simon hotels? Warm and Cozy Getaway Private Entrance + Terrace! Bright + Spacious Log Cabin in the Mountains Outdoor Hot Tub Access! Private + Serene Mountain Chalet Outdoor Hot Tub! Rustic Luxury Chalet Pool Table + Private Bar! Are there hotels in other cities near Lac-Simon? What other types of accommodations are available in Lac-Simon? Explore Lac-Simon with Expedia.ca’s Travel Guides to find the best flights, cars, holiday packages and more!